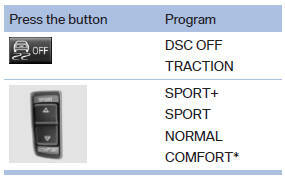 For Dynamic Damper Control*, the lower button is labeled with COMFORT. Failure of Integral Active Steering*. Failure of Dynamic Damping Control*. The vehicle has a flat tire.